Bondsman Arnaldo Corpus holds a document entered into evidence during a trial involving former Hidalgo County District Clerk Omar Guerrero's forfeited bond in County Court-at-Law No. 1 at the Hidalgo County Courthouse, Monday, April 2, 2018. EDINBURG — After a bondsman failed to reach an agreement with the state, trial began Monday afternoon in Hidalgo County’s first bond forfeiture case. The case is tied to a bond Mission-based bondsman Arnaldo Corpus posted for former district clerk Omar Guerrero in May 2013, which came after Guerrero was arrested on a misdemeanor charge for tampering with the identification number on a firearm. Because Guerrero failed to appear in court, the state initiated the forfeiture process for his $50,000 bond. Unlike most trials in which jurors are presented witness testimony, this case rests on a paper trail. Jurors will make a decision solely based on a handful of documents provided to them by the state and the sole testimony from Corpus. The documents entered into evidence Monday included the bond, notices to appear in court and notices of failure to appear, among others. Corpus’ attorney, Oscar Alvarez, contends that county staff, including those in the county clerk’s office and County Court-at-Law No. 1, failed to follow various bail forfeiture procedures. In particular, Alvarez contests whether the court’s bailiff “distinctly” called out Guerrero’s name, if at all, to ensure Guerrero was in fact not present. Corpus testified that he did not hear this occur, which Assistant District Attorney Eric Schreiber underscored does not mean the action did not occur. When asked whether he thought Guerrero would flee given that he had done so before in 2006, Corpus testified that he did not, revealing that Guerrero never paid him the 10 percent fee, or $5,000, to post the bond. 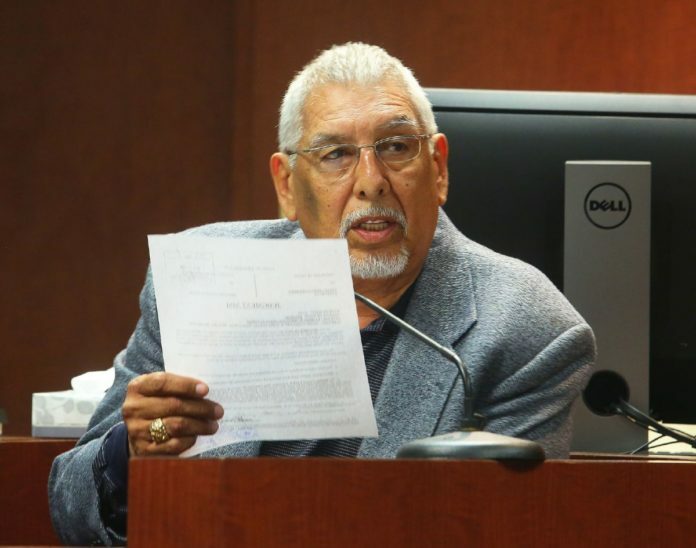 He told jurors he believes Guerrero failed to appear to his October 2013 arraignment because he feared then Hidalgo County Sheriff Guadalupe “Lupe” Treviño and then District Attorney Rene Guerra. Yet Schreiber stressed that Guerrero has yet to appear for any subsequent court proceedings despite the fact that neither official is still in office; Treviño resigned in March 2014, a month before pleading guilty to money laundering, and Guerra was unseated in the March 2014 primary election. Corpus also testified that while he doesn’t know where Guerrero is, he believes him to be in Mexico. And because Guerrero holds dual U.S.-Mexican citizenship, it would be against Mexican law for Corpus to hire a bounty hunter to locate him and bring him to Hidalgo County; rather, only an extradition order from the U.S. government would require Mexico to hand over Guerrero. Schreiber and Alvarez will present closing arguments Tuesday morning before the jury is tasked with deciding whether Corpus is liable for the $50,000 bond. Alvarez attempted to have the judge instruct jurors to decide the amount of money, if any, that Corpus owes the county, but County Court-at-Law Judge Rodolfo “Rudy” Gonzalez denied this request given that, under the law, the jury does not have this ability. Alvarez previously told jurors that the amount of the bond — which both he and Schreiber agree is considerably higher than most bonds set for Class A misdemeanors — significantly supersedes the maximum penalties attached to the charge, which includes a $4,000 fine and a year in county jail. It costs $52 a day to house an inmate in the Hidalgo County jail, which paired with the $4,000 fine, amounts to just under $23,000. This story was updated to reflect that the county clerk’s office was included in attorney Oscar Alvarez’s contention that county staff failed to follow various bail forfeiture procedures.